Parental Alienation or Runaway Sisters? 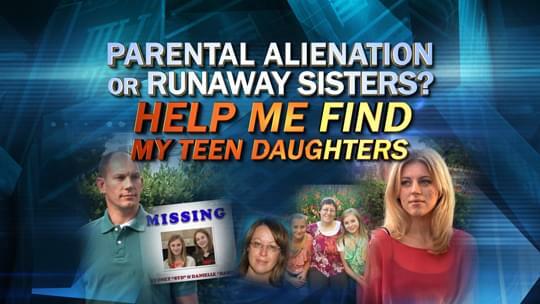 "Help Me Find My Teen Daughters"
Brian says he has been living a parent’s worst nightmare since July 2014, when his teenage daughters, Sydney, 15, and Danielle, 14, vanished while visiting their mother, Michelle, for the summer. Two weeks later, Michelle also disappeared, and Brian, who has full legal custody of the girls, says he believes his ex-wife is hiding them. Brian’s oldest daughter, Brittany, 19, says she believes the girls ran away so they wouldn’t have to live with Brian, who she claims is overbearing, controlling and abusive — accusations Brian firmly denies. Dr. Phil brings this father and daughter together for the first time in almost a year in search of answers. Plus, hear from Michelle’s brother, Troy, who says he has twice received videos of Sydney and Danielle. Does he have any idea where they — or Michelle — might be? And, see a brand-new video of the girls specifically addressing Dr. Phil. What do they say about the situation? Can Dr. Phil help get to the bottom of this mystery? In July 2014, two teenage girls disappeared while visiting their mother for the summer, and their father, Brian, hasn’t seen them or his ex-wife, Michelle, since. Brian and Michelle have been divorced for seven years, and Brian has had full custody of his daughters for the last four years. As scheduled, Brian sent 15-year-old Sydney and 14-year-old Danielle to Utah in May to visit their mother for the summer. But instead of returning to him, the girls vanished in mid-July. Two weeks later, Michelle also disappeared. “I am absolutely convinced Michelle and her family know where the girls are,” Brian says. “They are responsible for their disappearance.” — An accusation her family members deny. Brian and Michelle’s oldest daughter, Brittany, says her father is overbearing, controlling and abusive — “I thought it was normal to be afraid of my dad,” she says. “It was like living with a ticking time bomb” — and suggests that’s why her sisters ran away. Dr. Phil plays a video from the girls received moments before the show. Hear the message they have for their father. Dr. Phil questions Michelle’s brother, Troy: Does he know where the girls are? And, how does Brian respond to claims that he was verbally abusive? Tune in to see what Brian’s wife, Angie, says about the rules the girls had to follow in their home. Plus, learn what the court reports had to say about Michelle during the custody dispute following Brian and Michelle’s divorce. Tune in to see Dr. Phil read an email from Michelle to Brian, and hear Dr. Phil’s message to Michelle. If you have any information about missing teens Danielle (“Dani”) and Sydney (“Syd”) Wolferts, please call the We Help the Missing tip line: (866) 660-4025.